In this post I’m going to talk about week 3 of my Decentralised Teaching exploration. In this lesson we have a class discussion on the first episode of Sherlock entitled ‘A Study in Pink’. 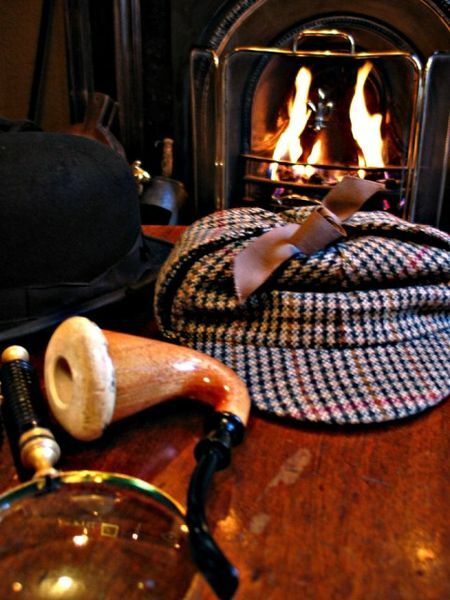 I also use language from Sherlock to introduce the concept and features of Spoken grammar. One learner also found the phrase ‘Right up your street’ in the Sherlock episode, which we had previously studied in class – such serendipity! This lesson is week 3 of our negotiated syllabus, and the learners decided last week that they wanted to watch Sherlock at home and discuss it in class. 1) At the start, I put up laminated pictures of the main characters from Sherlock and we brainstormed adjectives to describe them. 2) I then wrote on the board discussion topics that learners had sent me already, and then elicited some more from the class. These included ‘Why do people kill themselves?’ and ‘No strong female characters’ – interesting themes! In fact, the moderator didn’t need to do much as everyone had so much to say about the film. People found the relationship between Sherlock and Watson interesting , and there was also an interesting debate on why there were no strong female characters. I think the words ‘eye candy’ and ‘bimbo’ were mentioned! The female characters that surround Sherlock seem to be either motherly (Mrs. Hudson) or romantic (Molly Parker). There are stronger peripheral characters (the female detective, Waton’s counsellor) but they don’t have a big part to play. 4) I gave feedback on errors and good usage that came up during the discussion. One error was “He likes the danger” – When generalising we tend to leave out ‘the’. This part of the lesson is available separately here, where you can also download the materials. 5) I took out ten sentences from the film, and learners had to first match the sentences to one of the characters. Then I presented on the whiteboard the phenomenon of ‘Heads and Tails’ – where native speakers front-load or back-end meaning, depending on the context. This is something that learners of English rarely do in my experience. Of course, this isn’t entirely their fault as we still base grammar teaching largely on written grammar, which is one reason why learner’s speech sometimes sounds unnatural or long-winded. Let’s take a few examples. I also introduced the concept of ellipsis, where native speakers often shorten their utterances to convey the most basic meaning, like in the question “Got the time?” (instead of ‘Have you got the time?”) which, while it isn’t perhaps the most polite way to ask for the time is perfectly correct and extremely common. They had 15 minutes – the game is on! Why do native speakers use Heads and Tails? It’s more efficient, we use them for emphasis and clarification (and also perhaps for variation) when speaking. Why does Mrs Hudson use Future Continuous here? It’s a formal offer – she’s offering the other bedroom. 8) Unfortunately we didn’t have enough time for the final part! I then wanted the class to role-play a scene from Sherlock using some of the phrases we had studied – but there was no time for this as we had started a bit late. Also, this was a 2-hour class and having a discussion and then a ‘grammar discovery’ task was very tiring. I also would have limited the items I wanted learners to find – perhaps just to heads & tails and ellipsis, as the task was quite challenging. 1) It’s a perfect opportunity to introduce your learners to Spoken Grammar. This will help them produce more natural speech. I intend to do another lesson on ‘Spoken Grammar and Reported Speech’, as there as a few ways of getting round the (ever complicated) back-shifting of tenses. N.B. Transcripts are available! Just go to Ariane DeVere’s website here (a big thanks Ariane!) for complete transcripts of all the episodes. 2) It’s contemporary, slick, well-made and has themes which provoke debate! 3) You can ‘flip’ the classroom as I did, where learners watch at home. Or you could watch it in class over a series of lessons. 4) There are lots of potential avenues to explore like London, British culture, formal and informal registers, project work, presentations on ‘……’, story writing – the list is endless. 5) It promotes Decentralised learning. The preliminary work – watching, interpreting and understanding content was all done at home. Then we used the class primarily for language work. In this class, the learners decided their own topics and held their own discussion. Very timely. Just watched Sherlock on DVD for the first time recently. Never previously seen and thoroughly enjoyed it. Was interesting to compare the 60 min. unaried pilot with the more polished and quite different 90 min. re-shoot. If I had a class to teach right now, I would love to use this show because of the treasure trove of natural spoken grammar. There is, indeed, lots of ellipsis – the character of Sherlock is quite precise when speaking, saying no more or less than he needs to in an any given situation. At times, quite short and blunt, while at others very descriptive and detailed, such as when explaining his deductions. 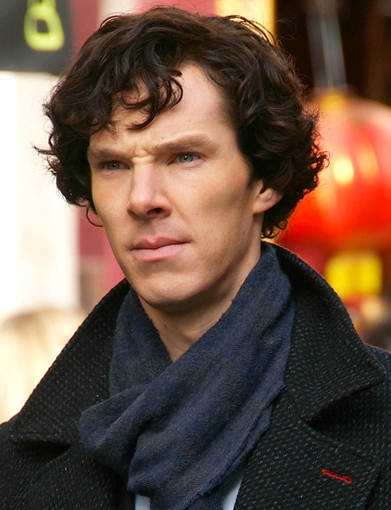 Holmes, at times, can also be very economical with his use of language, often irritable and short-tempered. Q. You say that your students requested this show to be used as part of a negotiated syllabus – is it already a popular show in Berlin/Germany amongst language learners? And did you have to watch or re-watch it yourself first? Hi Phil – thanks for commenting. When I was watching I was stuck by the language in Sherlock. It’s at a very high level of course but I don’t think it’s beyond the reach of B2+ learners. I thought the spoken language was very well written and very close to authentic spoken english. Also, there’s a lot being communicated without much being said sometimes – the characters can be quite economical at times as you say. So I thought it would make an interesting lesson. Regarding your question. Surprisingly the learners had no prompting from me! One of the people in the class provided me with a list of films (see Week 2 http://wp.me/p3Wm0j-6u) and we voted on the favourite. I have no idea if it’s popular here – I don’t know. But younger people can watch so much international tv programmes and films these days – DVD’s can provide translations in so many languages as well. Yes, I had already seen it, but I did re-watch it again. I found having the transcripts really valuable for coming up with the class activities. I actually did a whole series of lessons on The Apprentice for this particular group which they really liked as well. I find that Business English learners like a lot of useful phrases they can pick up and use in their everyday work. And you’re right, there’s a lot of great spoken grammar and phrases in Sherlock to be used! This entry was posted on November 18, 2013 by paulwalsh in DCT in action, For Teachers and tagged clarification, Decentralised Teaching, Decentralized Teaching, discussion, ellipsis, emphasis, heads, learning, Sherlock, spoken grammar, Syllabus, tails, Task based Teaching.